This book is a recent addition to my library. Self-published by Wayne Bailey, owner of the blog Wayne Bailey Racing and a regular writer on betting in The Irish Independent newspaper. I am always rather dubious of self-published works. There are many self-publishing platforms and it is easy to search for the publisher of a book to determine if the book is an act of vanity publishing. Many books promising get-rich-quick schemes, of which gambling is an obvious example, are self-published either because a reputable publisher does not want to be involved in telling untruths or because the author has no expertise in what they are writing about. That being said at least Amazon allows you to read the index of any book it sells to determine if it is worth a read. I was drawn to the contents of this book and so I decided to buy it. Having read the book I can say it is certainly one of the best self-published books on sports trading that I have read. Indeed there are some things in the book that some traders might wish had never been published but which will now be in the pubic domain. As is usual for this kind of book the opening chapters consist of the basics about how exchanges work and obtaining 3rd party software with which to trade. When asked about my trading style, I like to say that I trade market structure more than anything else. I don't know anything about horses or horse racing but I do know markets, no matter what is being sold in them. 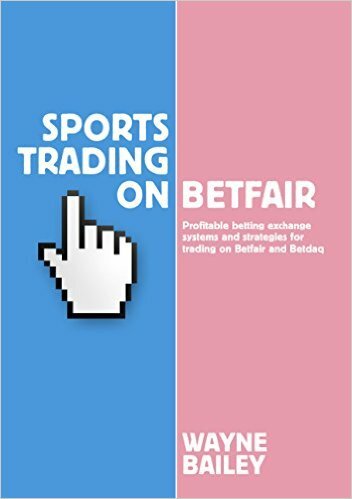 I can see from reading this book that Mr Bailey has understood the structure of horse race betting markets and uses this information to his advantage. A lot of it is psychology combined with the way the exchange is set up. The first topic in the book points out the rather obvious fact (although many people still haven't noticed it) that the integer odds (2.0, 3.0, 4.0 and so on) are very important when trading. Looking at 2.0 we see that 2.1 is 5% greater than 2.0 and 5 ticks above. However, 1.9 is 5% below 2.0 but 10 ticks below. This is because at 2.0 we are transitioning from a 0.02 per tick change above 2.0 to 0.01 per tick change below 2.0 For a layer, this is good because we have so much more leeway if the best goes against us. There is more upside to a price drifting out and resistance if it reverses. This is true for all the integer odds. This is what I call trading market structure. It has nothing to do with the sport or its participants but everything to do with how the market is set up. And this is what makes Mr Bailey's book a cut above many others. Mr Bailey then moves on to scalping and does so in a far more intelligent way than I have seen before. Watching YouTube videos or reading other blogs or forums you would believe that successful scalpers have magical powers. They don't. Through reading this book a logical reason for profitable scalping is given. You won't be a successful scalper if you don't have the correct psychological profile, the right software or hardware but all things being equal the two scalping systems Mr Bailey gives are the ones that I have used successfully. In fact I don't like to sully the techniques with the word 'scalping'. It is common sense one-tick-trading. The book also covers more traditional technical trading systems from the financial world and that I also use. These systems include support and resistance trading and swing trading. Also covered is Dutching, arbitrage and weight of money (or weight of movement as it is called in the book). There is a also some tentative analysis of inplay system trading. Although, Mr Bailey states that he is new to this and working on new systems. However, he does talk you through some of his current systems to give you an idea of how systems are built. All-in-all I recommend this book to all beginner and intermediate traders looking for new ideas. The main thing to learn is how to trade market structure more than anything else. That is how I trade the markets and so should you. I also found Wayne's book useful and would recommend it. Probably best to read my latest book, BTT, if you have not read it already.